What tastes like a dish of cassoulet, looks like a mural by Diego Rivera or feels like a seat on a Japanese bullet train might just be the best extracurricular education a person can get. Travel, for all its foibles, follies and frustrations, can be, and perhaps should be, a mind-altering and life-changing experience. Travel writers Arthur and Pauline Frommer live this creed and are bringing their message, as well as means to achieve it, to the Community Library in Ketchum this week. 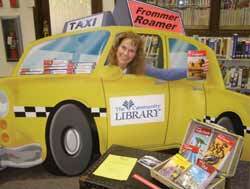 The library's display of a yellow taxi, dubbed the "Frommer Roamer" edged out a library in Baltimore last September in the Wiley Library Team's Library Display contest on Facebook. Voters signed on to Facebook and "liked" display photos posted by libraries. For their efforts, patrons of the Ketchum library earned a visit and presentation from the father-and-daughter writing duo, scheduled for 6 p.m. this Thursday, June 14, as well as a donation of 50 new travel guide books. Pauline Frommer will get something in return: Idaho is one of only four U.S. states that she hasn't been to. "I'll check another one off the list, so I'm very excited," she said. She said the contest, now in its third year, is a way for the Frommers to say thank you to libraries. "They're the most important venue for our books," she said. "We love libraries. We're thrilled they continue to support the guides." In a larger sense, she said, libraries are an important basis in a democracy, which requires an informed populace to elect leaders. She said travel, too, helps people to think critically—about themselves, their beliefs and how they fit into a global picture. "Travel changes you. It broadens your world," she said. "I think it's the greatest form of education there is. You can read about another culture, but until you're there, there will be misperceptions." Frommer said travel take-aways can be both good and bad, but in a global society, every bit of information can be useful as countries are increasingly intertwined. The Frommers' guidebooks have been a part of people's travel experiences since the 1950s, when Arthur Frommer debuted "Europe on $5 a day." Although the Frommers' name in travel is now licensed by John Wiley & Sons, the Frommers themselves continue to move people to explore their world. In the decades since that first Frommer's budget guidebook, travel options expanded, and travel information kept pace. "We keep adding more and more books because people keep wandering farther and farther," Pauline Frommer said. The series now has about 330 books. Frommer said rather than changes to content, people are asking for different methods of delivery. The hardcopy Frommers guidebooks are now supplemented by free online information, phone apps, iPad books, blogs and downloadable walking tours. "We have all of the bells and whistles," she said. While the explosion of online travel information has made any question answerable, Frommer said reliability is less certain. "A lot of material online is not kosher in terms of journalistic integrity," she said. Some reviews are not user-generated at all, or may have been paid for through freebies, she cautioned. "These reviews are very powerful and they're being subverted," she said. "When you read a guidebook you're taking advice from someone who has been to every hotel in that area. Our only customer is our reader." When people need to narrow down an almost infinite travel to-do list to a manageable itinerary, Frommer advocates a loose agenda tailored to individual preferences—but one that includes a few must-see sites. "Look at what interests you," she said. "Too many folks feel travel should be a checklist type of activity. I think you're missing out if you go to Paris for the first time and you don't go to the Louvre. There's a reason why that museum is so famous. Don't overlook famous sites, but also try to balance that time to just get lost and explore the culture." Many people stuff their itineraries to see what's dead, she said, rather that the living culture. "Talk to a local who isn't the concierge at your hotel," she said. "Sit at a bar and talk to a local. Schedule in time just to wander." Frommer said travel can be tailored to almost any budget, but those with less funds might have to build a little more flexibility into their trips. "You just can't be too squeamish," she said. "Figure out what you're going to do differently. If you have a big chunk for transportation, save in lodging costs." www.globalfreeloders.com, www.couchsurfing.org and www.airbnb.com offer alternate options for lodging. Museums are often free one day a week, parks are free and public buses give a cheap tour of town. "If you put a little effort into it, travel doesn't have to be crazy expensive," she said. Bargain hunters trying to dodge the airline industry's piled-on fees and high penalties can feel the mystique of travel is long gone, if they ever experienced it at all. But Frommer tries to keep it in perspective, and she sees good fortune behind people's ability to be mobile. "We as travelers get too hung up on the hassles of travel," she said, "especially airport security. For the most part, security takes 10 minutes. I don't understand what this huge outpouring of angst is behind it. It's still a miracle that we as a culture travel for leisure. "The fact that we can be on the other side of the planet and stay for a week and not kill our budget ... it's a miracle. It's wonderful." Travel guide writers and publishers Arthur and Pauline Frommer will visit the Community Library at 6 p.m., Thursday, June 14. The father-daughter duo will present travel tips, money-saving ideas and suggestions about how to see more for less on the road. A screen will be set up outside the lecture room so any overflow crowd can hear the presentation. The talk, "Major New Developments in the World of Travel," will be followed by a reception and book signing in the library's new travel section, the Departure Lounge. Champagne and light hors d'oeuvres will be served. For more information visit, www.